The Matrox Maevex video distribution over IP solution consists of the Maevex 5100 Series encoders and decoders that can extend or record up to 1080p60 video and audio over a standard IP network at user-defined low bit rates for excellent quality and minimal network bandwidth consumption. See below for specific details on each SKU or call us at 914-777-3615 for any questions. We’d love an opportunity to help you get the answers you need. Exceptional quality H.264 full HD 1080p60 and 1920x1200 video over IP decoder. Encode and record H.264 up to full HD 1080p60 and 1920x1200 video over IP. The Maevex encoder streams or records high-quality video and audio and uses the H.264 video compression standard. It can stream to Maevex decoders or any device or PC that supports the required network protocols. It can also record to a shared network or NAS drive. 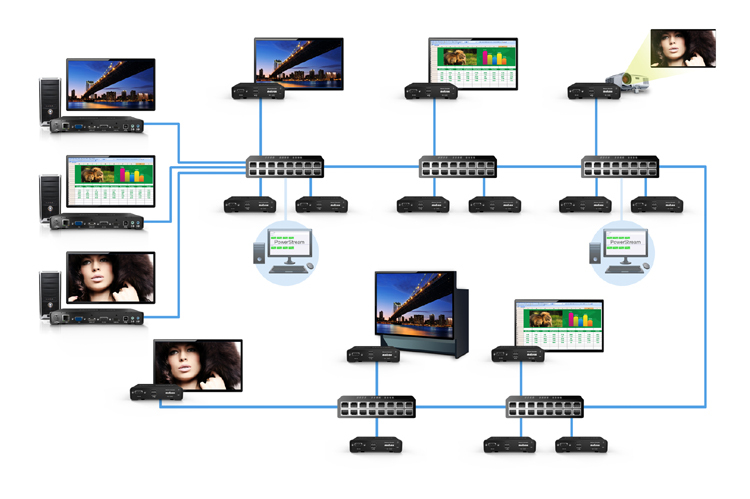 The robust Matrox PowerStream™ software is included with the hardware and is used to remotely discover, manage, and adjust the Maevex network and lets administrators conveniently define multiple stream parameters and balance network bandwidth consumption and quality. The Maevex API is also available to enable programmers to integrate current features into existing applications or create new, independent PowerStream-like software to meet their specific needs. Matrox PowerStream™ manages, configures, and updates Maevex appliances via the network from one or more central locations and allows Decoders to be assigned to streams. Maevex 5150 Encoders and Decoders, compatible with different types of outputs as well as network switches to extend the network, enable the distribution of video and audio over standard LAN connectivity. If you want more information about the Matrox Maevex, please call us at 914-777-3615, email INQUIRY@ITPROS.COM or click the button below to be redirected to our contact page and fill out one of the forms.